This is one of my current projects (started it 2 nights ago). This is the center section of a scarf/shawlette. The next step will be to pick up stitches along the lower shaped edge and work down in a yet-to-be-determined lace pattern. The yarn used is Crock-O-Dye, in 2 colors: 535 olive (the lighter green), and a new color (will be in stock late winter) 573 sprucewood. I did several swatches before settling on this pattern. 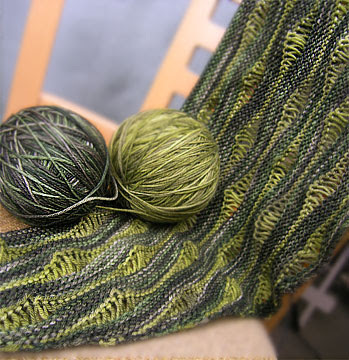 I like the way the lighter green pops in the elongated stitches. Yes, and I am almost done with it, and it looks great!